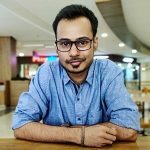 The Samsung Galaxy J7 Prime which was launched in Vietnam last month is now coming to India next week on September 19. Samsung India has started sending out press invites for the event which is held on September 19 at 11.30 am. 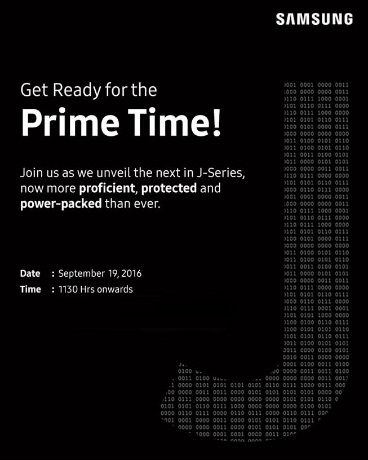 The invite doesn’t mention the name of the device to be launched, however, ‘Prime Time’, ‘the next in J-Series’ and the big J written in binary is proof enough that Samsung will indeed launch the Galaxy J7 Prime. The Galaxy J7 Prime is powered by an octa-core processor which is laced with 3 GB RAM. The device features a 5.5-inch Full-HD display which is backed by a 3300 mAh battery. The device boots up to Android 6.0.1 Marshmallow and also has a fingerprint scanner housed on the home button. Other specs include 16 GB internal storage, support for 4G LTE with dual SIM, expansion of storage up to 256 GB via microSD card, 13 MP rear camera and an 8 MP front camera. There’s no information about the pricing yet, but, the device is expected to be sold with a price tag of ₹18,790.